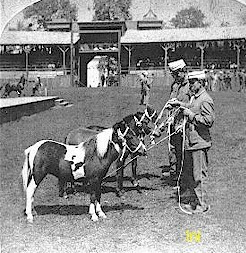 The Universal Exposition offered a total of $3,410.00 in cash prizes to the winners of the Shetland Pony exhibition. Judging took place August 22, 1904, through Saturday, September 3, 1904, commencing at 10 oclock each day in the Forum. Although not a large show, each exhibitor entered two in a class for the most part. Exhibitors were Chas. E. Bunn of Peoria, IL, Geo. A. Heyl of IL, and B. F. Shelman of Weatherby, MO. 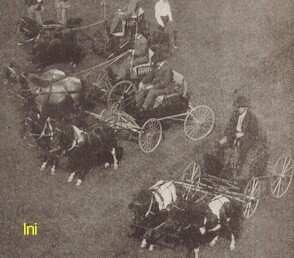 The Shetlands were judged by Dr. C. S. Turnbull, Philadelphia, PA. Breeders had sought to put the legs of a horse under the body of a pony. This eliminated the round, rough legs and steep pasterns. The Shetlands exhibited legs of flat bone with well-defined joints and supple pasterns. It was claimed that a clean, trappy trot was preferred in Shetlands over the stiff-legged shambling action. Since Abelard had ranked among the best in the aged Stallion class and was known for his type, quality, and trappy gait, it was a surprise when David Harum took first place. This horse stood square on his legs, but was described as poddy and short-rumped. Third place went to a large but impressive bay and white, named General Shaffer. Photos from the Irwin collection. This page was designed by Lisa Blankenship and is maintained by Lyndon Irwin.